Instead of you spending some extra amount of money for someone to re-fletch or use shrink tube, do you know that you can DIY with your best fletching jig and save money? To have a better grip on how to DIY, I have highlighted some important aspects of a fletching jig you should know. I even give you alternative solution which save your time latter in this guide. What Is a Fletching Jig ? How Many Vanes Do You Want To Fletch Simultaneously? My uncle had his first Bitzenburger jig in 1998 and was able to use it for a long period by simply by cleaning and storing after each use till he decided to move to a newer model. With this jig, you can save yourself a ton of money since you won't be replacing it anytime soon. This jig allows you to make a right helical fletch or get another clamp with a different type of fletch. You can also use it in the making of up to 4 fletches. There are a few downsides to the Bitzenburger jigs. One of the drawbacks that affect a lot of users is the cost of the jig and are also the problem of clamps. You can get different clamps for a different fletch, but with the Dial-O-Fletch, you may need to get a clamp separately before you can use it. Another drawback you have to take note of is that the jig may be slow to use. With protective tape on the jig, glue does not come in direct contact with the jig and cleaning the glue after use won’t be a serious issue since you can easily replace the tape. The Last Chance Fletching jig is useful for making helical fletch of up to 5 degrees. It also allows the user to select if it is 3 or 4 vanes that will be attached. With the coated vane wires, we can safely say they do not retain glue after fletching. The drawback to this device is the uneven pressure which is applied to the vane. This makes it difficult for the vane to stick to the shaft. It may fall off in some cases. This also causes excess glue that needs to be cleaned. 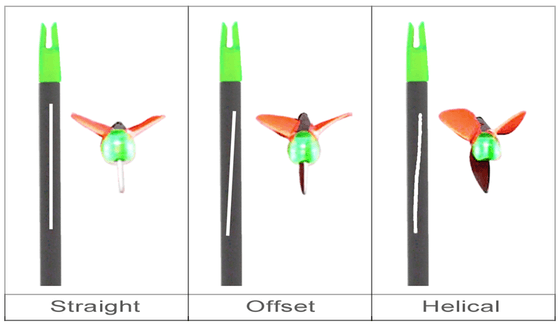 The E-Z mini is a plastic fletch, which is suitable for your right helical fletch. It can be used on fletching arrows with a length of 2.25 inches. The E-Z mini offers great advantages as it is quite easy to use and also convenient. By allowing you to fletch three vanes simultaneously, you can save a lot of time when using this jig. While the E-Z mini may offer you some great features for the price, it also comes with its limitations and downside. The first thing you may notice after using the jig is the glue it starts to build up at the bottom of the vane slot. Another problem you may encounter is after cleaning the jig. Since it is made of a plastic material, it is easy to get scratches on the jig after cleaning. Also, the limit to the number of fletches you can perform on this jig is just three. The Jojan multi fletcher is built to last a long time. The aluminum﻿﻿﻿ materia﻿﻿l makes it very durable. There are lots of features which make this jig great. Of all the jigs which were able to make it through our selection process, the JoJan has proven to be the most efficient when you talk about how much time you save. It allows you to fletch up to 6 arrows at the same time, and this also makes it a very economical option. This is if you consider how much you will need to get six jigs. You can also perform a straight fletch or an offset to the left or the right on this jig. The jig also has accessories which can easily be replaced by using other JoJan parts. It also allows you to make up to 4 fletches on each arrow. The drawbacks of this product are that it can't be used to make a helical fletch on the arrow and also needs other accessories like the cross bow bolt. This means more money will be spent. When you need to attach vanes to the shaft of your arrow, a fletching jig holds the arrow shaft steady so you can apply glue to the vanes at precise locations in a configuration you have selected. Its main purpose is to ensure that the pattern formed, may be helical, offset, or straight, or the vanes do not change, and the spacing between them remain intact until the glue applied properly dries. The configuration of your fletch usually determines the type of jig you will need. There are lots of configurations, and not all fletching jigs can handle all these configurations. Although you may be able to customize the jig by changing some of the parts to those that can support the spacing of fletches, number, and style you prefer. Straight fletching is the simplest type of jig you can find on the market currently. This type of fletching has the vanes aligned with the arrow. One of the main functions of this vane type is to cause the arrow to spin while it’s in flight. When you decide to make an offset fletching, you will be setting the vane to form an angle with the arrow line. The angle can be to the right or left to give you an increase in the rotation from the arrow while in flight. Depending on the jig you get, you might be able to make minor adjustments to support your offset angle accurately. To get a better understanding of the helical fletching, you should imagine making your vane in the form of a plane fan blade. It may be a left or right helical. Setting the vane at an offset and then twisting the vane slightly, you can get the helical fletch. The material used in the construction of the jig will play a vital role when determining how easy it will be to clean and how long it will last. Materials that can be used include metal and plastic. Fletching an arrow may depend on the type of jig you use. Regardless of this, the basic steps to follow are the same. Our tutorial on how to fletch an arrow is made using a Bitzenburger fletching jig. Step 7: The vane remains on the arrow in the position you set it, and the process above is repeated until you have attached the number of vanes you need. The number of vanes that can be fletched at the same time may vary for different jigs. While some allow you to fletch up to three vanes at a time, for others, you may need to fletch the vanes one after the other. Most of archery fletching jigs allow all vanes to be fletched simultaneously to save time. If you find yourself in a bit of a bind and you need something to make a quick fletch or arrow repairs, you should try the Quickfletch twister vanes. These do not require any glue only a bit of hot water. Check it here. No doubt, these features give the Bitzenburger a better advantage over the other jigs on this list as some are made of plastic while others are limited to 3 vanes. Although the JoJan allows 6 arrows to be fletched, it still fails to get a helical fletch, and a loose grip, which may result in vanes falling off. We have given insights to some of the best fletching jigs that we have been able to use, but our preferences may differ from yours. We would like to get your opinion, feel free to comment or share it if you see it helpful.